Melvin L. Katten is a retired founding partner of Katten Muchin Rosenman LLP and presently serves as senior counsel. His legal practice includes tax and financial structure and counseling, corporate mergers and acquisitions, real estate and business ventures, as well as federal tax and criminal investigations. He is also a CPA. Mel is a former chairman of the Anti-Defamation League's Chicago Regional Board and past president of the Better Government Association and continues to serve on both boards. 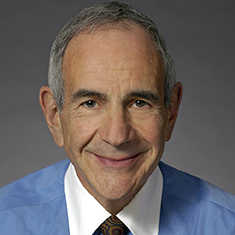 He currently serves as the Senior Vice Chair of the Board of Trustees of Roosevelt University, Chairman Emeritus of the Board of Directors of the Auditorium Theatre, President of the Pamela B. Katten Memorial Leukemia Research Foundation and Director Emeritus of the Leukemia & Lymphoma Society, Chicago Chapter. He also serves on the Chicago Loop Alliance Board of Directors, the American Friends of Tel Aviv University national board and the CeaseFire Illinois Advisory Board. In 2013, Mel was elected to Tel Aviv University’s International Board of Governors; he was also nominated to serve as a general trustee of The Lincoln Academy of Illinois. Shown below is a selection of Melvin’s engagements.